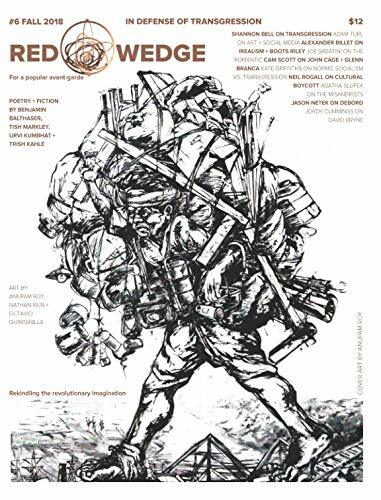 Red Wedge is the only English language Marxist journal with a mission of engaging cultural production as a whole. We make it a point, as goes our slogan, to “rekindle the revolutionary imagination”. Our work, including our involvement at these large conferences are steps towards encouraging a certain sensibility, a gravitation towards what we refer to as a Popular Avant-Garde. We reject populist and social conservative arguments within and beyond the Left that “experimental” cultural production is beyond the ken of the working classes; indeed we emphasize the role that this type of cultural production has played in revolutionary social movements since 1789. We have sponsored two panels at “Socialism in Our Time.” Taken as a whole, the speakers at both panels aim to resuscitate what is deemed merely a leftover, an obscurantist folk practice, a popular song, a cultural sensibility. We question standard accounts, for example, of “outsider art” or simplistic sociological accounts of counterculture. Our panel participants are visual artists, experimental musicians, queer activists, educators and critics. Put simply, we enter the hidden abode of cultural production from a wide variety of standpoints and a shared commitment to the communist project. Queer folks, artists, poets, and countercultural “weird” types constitute a growing fraction within the American working classes, and indeed, within the International Left. Struggles and debates within cultural theory and praxis constitute a vital part of any socialism in our time. Stella Becerril and Adam Turl, Historical Materialism Toronto (2016). Jordy Cummings, Historical Materialism Montreal (2018). Crystal Stella Becerril is a Brooklyn based poet, cultural critic, and independent journalist writing about Xicana feminism, class struggle, and the politics of aesthetics in pop culture. She’s been part of the Red Wedge editorial collective since 2013 and enjoys film, photography, graphic design and (like a good Xicana) Britpop is still her favorite genre. Jordy Cummings is a writer, cultural critic and Gonzo Marxist based in Toronto, Canada. He is the Coordinating Editor of Red Wedge and is adjunct faculty at York University where he completed a PhD in 2017. His primary research involves theorizing the relationship between the revolutionary left and cultural production during the long sixties. In addition to Red Wedge, Jordy has written for Jacobin, Le Monde Diplomatique, the Canadian Jewish News and countless others over 20+ years as a writer. Laura Fair-Schulz is an artist and an adjunct professor of Fine Art in Potsdam, NY. Anja Weiser Flower is a musician and activist from the Bay Area. Jules Joanne Gleeson is a queer historian and Londoner, based in Vienna. Her current research is focused on the exclusion of eunuchs from the Byzantine-era monasteries of Mount Athos. She's written for publications including VICE, the Verso Books Blog, Pluto Press, Identities Journal, and Viewpoint Magazine. Jules' work can be read here. Omnia Sol is an alternative cartoonist, musician, visual, and performance artist based in Chicago, Illinois. They are an Associate Art & Design Editor at Red Wedge Magazine and recently released their first graphic novel “H3AD1355” through Void Front Press. Adam Turl is an artist and writer from southern Illinois (by way of upstate New York, Wisconsin, Chicago and St. Louis) living in Las Vegas, Nevada. He is the art and design editor at Red Wedge and an adjunct instructor at the University of Nevada - Las Vegas. Turl’s most recent exhibitions include Revolt of the Swivel Chairs at the Cube Gallery (Las Vegas 2018) and The Barista Who Disappeared at Arspace 304 (Carbondale, IL 2018). His website, which he shares with the writer Tish Markley, is evictedart.com.